Overhaul of a Swift car at The Wem Motor Company. Homepage. 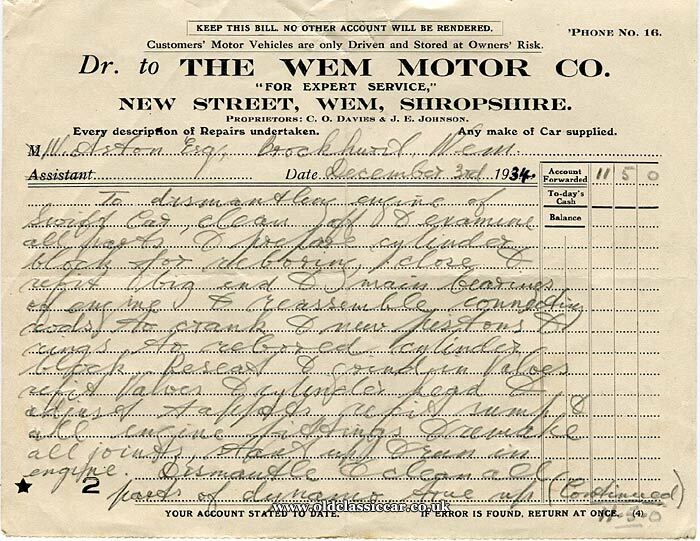 This page: Two invoices describe the re-furbishment of a Swift car at The Wem Motor Co., Salop. Artistically at least, these two items of paperwork aren't the most interesting of those to feature on OCC, with no illustrations of cars, garage vehicles, or even premises to brighten them up. However, the information handwritten onto them is. 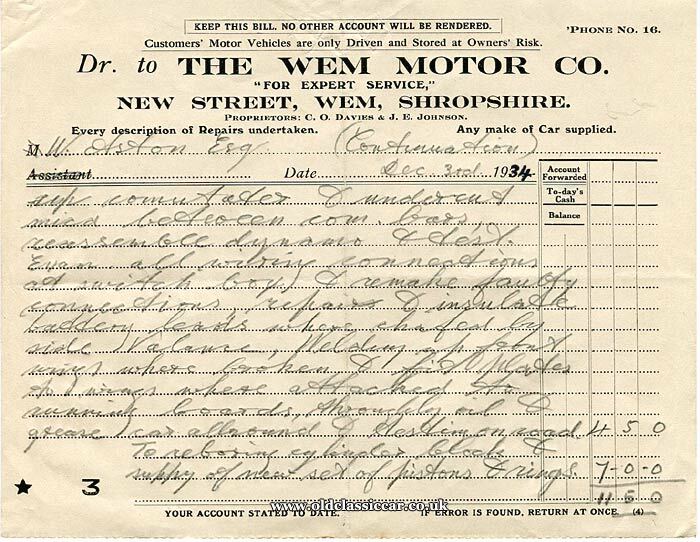 This two-part invoice was issued by The Wem Motor Company, in December 1934, to Mr Aston, of Blackhurst, Shropshire. The garage was using up old stationery, as the pre-printed date began "192...", but had to be manually corrected to a 1930s' date. The Wem Motor Co. was situated on New Street in the town, and a business of that name continues to operate on that street. I doubt that too many Swifts call into the garage nowadays, but in 1934, that's what C.O. Davies and J.E. Johnson - proprietors of the business at the time - were tasked with overhauling. To dismantling engine of Swift car, clean off & examine all parts, & prepare cylinder block for reboring, close (?) & refit big end & main bearings of engine & reassemble connecting rods to crank, & new pistons/rings to rebored cylinder block. Reseat & grind-in valves, refit valves to cylinder head .... refit sump & all engine fittings. Remake all joints, start up and run-in engine. Dismantle & clean all parts of dynamo, true up commutater (sic) & undercut mica .... reassemble dynamo & test. Exam. all wiring connections at switch box & remake faulty connections. Repair and insulate battery leads where chafed by side valance. Welding up front wings where broken & fit plates to wings where attached to running boards. Thoroughly oil & grease car all round & testing on road. Clearly the car had covered quite a few miles, and picked up some damage to its coachwork, by the time of the work being done, in 1934. Production of the Coventry-built Swift car had ended three years earlier, in 1931. 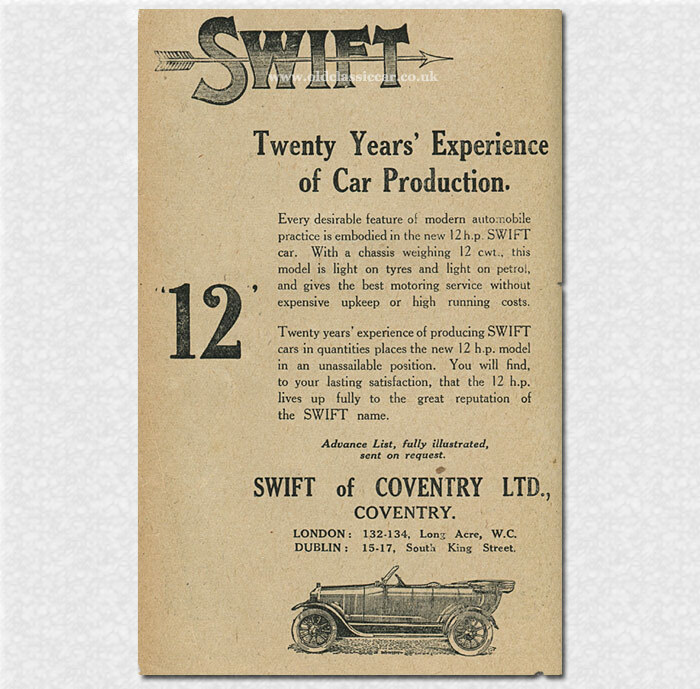 The advertisement below is for the circa 1920 12HP (RAC) Swift, in four-door tourer form, so could be similar in appearance to the car being worked on in Wem.